Dr. Harrison has been a life-long Michigander. After growing up in Cheboygan, he attended Western Michigan University and graduated with a bachelors degree in Psychology. He then continued on to Michigan State University’s College of Veterinary Medicine, receiving his degree with honors in 2002. He spent his first two years practicing in southern Michigan and moved back up north spending 13 years in Cadillac. He now proudly owns Tawas Animal Hospital. What he enjoys most about his work is being able to help strengthen the bond between pet parents and their pets, by educating clients about the best ways in which to keep their pets healthy. From this, he hopes pets will live happy and longer lives with their families. His special interests are orthopedic surgery, exotic pet medicine, and dog and cat behavioral medicine. I have always had a keen ability to find and rescue stray animals or bring them home. When I was a girl growing up in Texas I would bring home every stray animal I could find, and beg my dad to let me keep “just one more”. It was a perfect fit when Dr. Harrison (my husband) decided he was going to go to Veterinary School. I spent 22 years advising businesses on how to grow their client base as well as create business cultures and core value programs for new acquisitions and mergers. My secret was always do what’s right and when we make a mistake own it! After spending many years touring Michigan and the Country I am excited to be able to put my efforts into one community and one business. I am blessed to be able to dedicate my time to a community I love and raise my children in a family business. 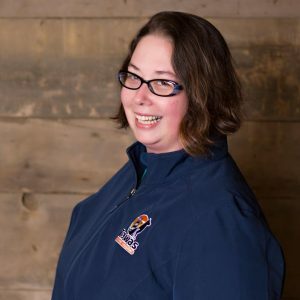 I am excited to be a part of Tawas Animal Hospital and love coming to work, I especially love watching our team grow, learn, conquer their fears and reach their goals. I am so proud to be a part of this team. I am a proud mother of 3 beautiful kids, 9-year-old Ben and 4-year-old twins Lucas and Reese and fur baby, Farley and Wither. I love to volunteer at my kids’ schools, community organizations, church and you can find her cheering my kids on at sporting and school events. I am excited to meet the pet owners in the Tawas area. Stop by and say “Hi” my door is always open. Emily started her career in veterinary medicine as a student of veterinary technology at Baker College of Cadillac in 2013. Shortly after starting classes, Emily accepted a position in Cadillac as a veterinary assistant under Dr. Harrison. She graduated with her Associates in Applied Science in May 2015, and later that summer earned her Veterinary Technician License. Emily joined the Harrisons on the day they bought Tawas Animal Hospital on November 1, 2017. Emily has a passion for helping clients become the best pet parents they can be. She enjoys sharing her knowledge of veterinary medicine and maintaining a high standard of care for her patients. Emily has a special interest in working with exotic animals such as reptiles, birds, and pocket pets. Emily shares her heart with her husband, Andy, and their four fur babies – cats named Swizzle and Twizzle, a golden retriever, Gambit, and a beagle mix, Sunnie. She is thrilled to have moved with her family to the Tawas area! Alice joined our team in July 2018 after moving back to Michigan from South Dakota. While in South Dakota Alice graduated from the National American University in 2015 where she received her A.S.S. in Veterinary Technology. Alice has made it her goal to care for animals and is currently working on her certification to become a Licensed Veterinary Technician. When not working she enjoys spending time with her 2 dogs Carolin and Desiree and her 4 cats, Miss Pretty, Scout, Jamie Lee, and Sarge. She also enjoys counted cross stitching and reading mystery novels. You can find Alice working behind the desk and she always knows how to bring a smile to everyone’s face. I decided to join the veterinary field shortly after becoming a pet parent to my “fur-st” born, a Bichon Frise my husband and I named Bentley. There was an instant connection between us. Experiencing the human-animal bond first hand I knew I wanted a career in which I could help advocate for quality animal care. I love coming to work knowing I can do my best to help further strengthen the bond between people and their furry/scaly/feathered family members through education and support. I live in Oscoda with my husband Brian and our 2 dogs Bentley and Odin. When I am not at the clinic you are most likely to find us and our dogs at the beach, on a boat, or walking/hiking the many trails in this area. Tabatha moved to Tawas to join Dr. Harrison in February 2018. Tabatha previously worked with Dr. Harrison in Cadillac, MI for 3 years before joining him here at Tawas Animal. Tabatha is a Licensed Veterinary Assistant and is currently going to school to become a Licensed Veterinary Technician. Tabatha was born and raised in California. She moved to Michigan with her husband Casey and her three energetic boys Michael, Mathew, and Andrew. Tabatha is an avid reader, loves to drink coffee, and enjoys life through laughing, learning and having fun with friends and family. Tabatha shares her home with her family and her 2 cats Piper and Vinnie. She dreams one day having a Golden Retriever. Tabatha mission at work is to provide clients the education and resources they need on preventive care and helping solve “mystery” cases. I moved to this area from southern Michigan last May and joined the Tawas Animal Hospital team. I have 2 dogs, 2 cats and a parrot. I love being involved in animal medicine as it is a little difference from the human side from which I came from. I learn something new everyday and I enjoy being a part of this caring, incredible team. Jenni lives in Hale, MI with a beagle and 2 kittens. She enjoys spending time outdoors, hunting fishing or just exploring. Jenni started working towards her Licensed Vet. Assistant degree and truly enjoys working with your pets. Jeni Joined our team on November 1, 2017, and has jumped in everywhere we have needed her. She says she loves her job and the team she works with. Erica is an avid animal lover. She is in college planning to pursue a degree in Veterinary Technology. She loves to help animals and make them as happy as possible. Erica loves to go boating, hunting, and spending time with her family and dog, Kona, the black Labrador Retriever. She has raised and been around Labrador Retrievers her entire life.